Steel: Carolina Shade Sails uses structural steel for our architectural fabric structures. Our heavy duty type of steel comes from the reputable Allied Steel whose products are made from cold-rolled, galvanized tubular steel with a triple layer of protection. Allied Steel products outperform most steels in tensile strength and long-term corrosion resistance, as well as saltwater spray and other weathering tests. Fabric: Our shade sail fabric cloth is known for its strength, vibrant color and durability. The high-density polyethylene fabric with ultraviolet additives is Rachel knitted so material will not unravel when cut, ensuring stability and a consistent shade sail pattern. All of our shade sail fabric passes the ASTM E-84 fire rating test as well as the NFPA 255 and NFPA-701, and is rated a Class 1 Material. Thread: Tenera thread used for stitching is guaranteed not to rot due to UV exposure or other environmental causes. The thread carries a lifetime guarantee. Corners: Fabric connection points are triple reinforced. Each connecting point has vinyl sewn between layers for reinforcement. Cable & Fasteners: Tensioning cable is galvanized steel; fasteners are stainless steel. 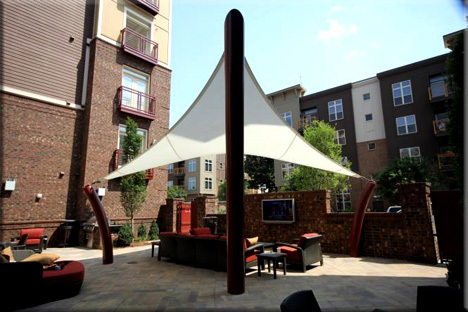 Quick & Easy Cover Removal: Carolina Shade Sails require no special tools for removal. Just loosen the turnbuckles and you’re done! Colors: Call us for a complete listing.